Just a week ago, we had seen the Moto G 2015 in a video which tipped the specifications of the device and now, images of Moto G 2015 have been leaked again. However, we don’t know yet when it will be announced or launched, but the Moto G 2015 is surely creating a buzz in the smartphone world. Earlier, we came to know from the tipped specs that the Moto G 3rd Gen will feature a 5-inch display and also it will be powered by a Qualcomm Snapdragon 410 processor coupled with 1GB of RAM, which is quite disappointing because at the price segment of Moto G 2nd Gen also, many other phones are being launched with 2GB of RAM. In case of storage, it has 8GB storage and microSD card slot for expansion. The smartphone is likely to run Android 5.1.1 out-of-the-box. The video also claims that Moto 3rd Gen supports LTE, however there might be a 4G variant as well like previous generation. Now, some images have surfaced on the web and we have got some more details about the phone. 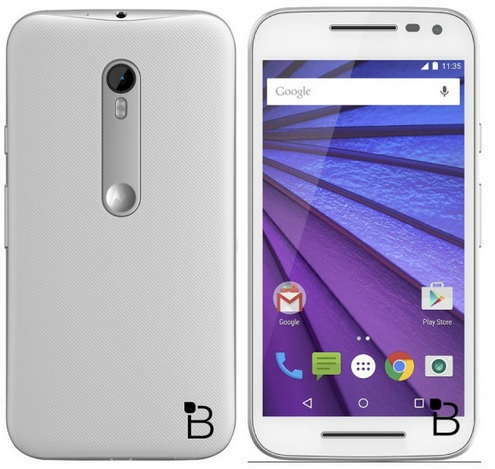 The Moto G 2015 is codenamed Osprey, and the Moto G 2015 will debut with the model number XT1540. The rumored specs of Moto G 2015 include a Qualcomm Snapdragon 410 SoC, 1GB of RAM, 8GB of expandable memory, 5 inch 720p display, and 13MP camera. The device will debut with Android 5.1.1 Lollipop on board. Well, everything seems to be pretty well, except the RAM. till now, I have seen the buzz in Moto communities that people are a little disappointed with the RAM, as most of the fans had been expecting 2GB of RAM onboard the Moto G 2015. However, the specs aren’t bad at all and I think Motorola is trying to make a highly optimized device, which will come at a low price tag for sure. Well, only time will reveal what we are going to see in Moto G 2015. What do you think about the Moto G 2015? Let us know in the comments section below. You can also connect with us on facebook to stay updated about the latest buzz and news on the move. Join us on Facebook here.